pdfToolbox Desktop can do more than just checking or fixing one file at a time; the Batch Processing mode allows it to process multiple PDF documents within a folder. 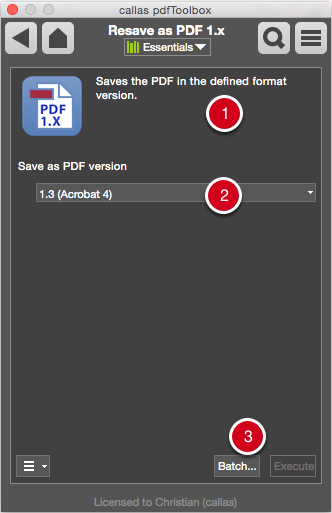 The Switchboard allows you to apply any Action to all PDF files within a given folder. 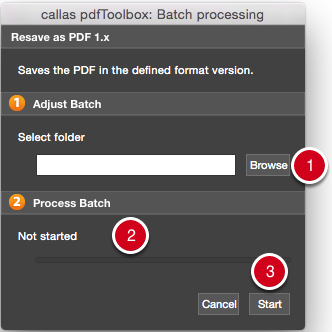 The Batch function in pdfToolbox can process up to 100 documents one after another. For a high-volume approach using hot folders, pdfToolbox Server is recommended. ... And apply any desired Settings. Click on the Batch option to specify additional batch processing settings. Under Heading 1, select the folder containing the PDF files to be processed. ... Once you click on the Start button. Depending on the processing results, the files will then be stored either in a folder containing successfully processed (Success - 1) or unsuccessful results (Failure - 2). These are located in a folder named with the timestamp - 3 for the processing point which will be automatically shown after processing is complete.